The knee contains two cruciate ligaments and two collateral ligaments or collateral bands. They all connect the femur to the tibia or fibula and provide the knee with stability. On the inside and outside of the knee we have the collateral ligaments or collateral bands. 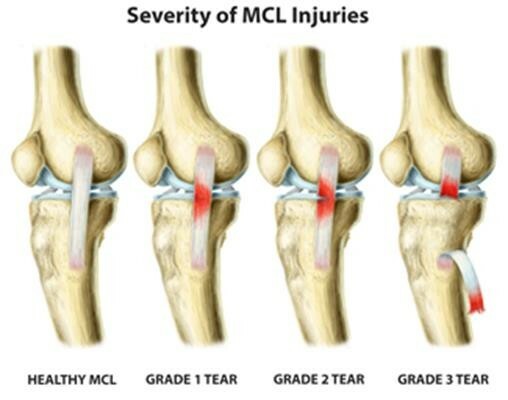 On the inside is the medial collateral ligament (MCL). On the outside is the lateral collateral ligament (LCL), a very strong ligament that is attached to the head of the fibula. If a collateral ligament is torn or affected this causes severe, often localised pain, as well as instability. The instability often only appears over time. Most injuries occur at the anterior cruciate ligament and the medial collateral ligament. A torn medial collateral ligament occurs after the knee makes a valgus movement: a movement in which the knee or entire leg is forced into an X position. This is usually the result of a distortion or sagging of the knee, or when a force impacts the outside of the knee (being hit by a car, football tackle). The medial collateral ligament generally heals on its own within six weeks. A temporary brace is sometimes needed to protect the healing process. An operation may be required in severe cases. The lateral collateral ligament is an extremely strong structure and therefore, an isolated tear is very rare. If injuries do occur, it is usually in combination with an injury involving the rear cruciate ligament. If this is the case an operation is generally recommended.